While proper maintenance of the turf is required to keep any lawn healthy, knowing what type of lawn grass you have is also essential. Different types of lawn grass are found in different climates, growing conditions and temperate zones; this requires knowing what type of lawn grass you have. To determine the type of grass you should understand common characteristics found in the many varieties of turf grass. Determine the growing zone for the selected region by looking up the zones on the USDA website. Find your state on the map; use the color coding to determine the growing zone of the state. This will help determine the types of lawn grass that can grow in your region. Different types of lawn grass grow in different climates; northern zones can have Kentucky bluegrass, rye grass or fescue while southern zones will not have any of these types. Research the type of lawn grass that grows in your selected region. Contact the local agricultural extension service of your state university for information about the types of lawn grass that can be found in your growing region. Look at the leaf fold of the individual blades of grass. There are two types of lawn grass leaves, folded leaves and rolled leaves; this is called the "vernation." The vernation of bent grasses and zoysia is a rolled form when the blade is new. You will find folded vernation in new blades of centipede, fine fescue and St. Augustine. Examine the leaf structure of the grass. Flat, wide blades are typical of St. Augustine while narrow, crimped blades are common for Kentucky bluegrass and fescue. The "ligule" or juncture of the blade with the stem will help determine the type of lawn grass. Look for Bermuda, St. Augustine and zoysia to have tiny hairs at the ligule. You'll notice that rye grass, fescue and Kentucky bluegrass have no hairs while rough and annual bluegrass have a film-like membrane at the ligule. Observe the tip of the blade. 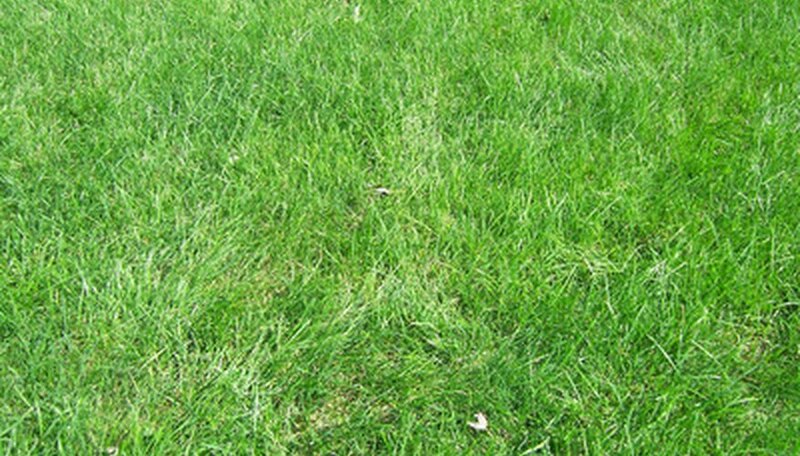 Most types of lawn grass have pointed ends. Lawn grass such as St. Augustine has rounded ends; all varieties of bluegrass have tips shaped as the bow of a boat. Identify the types of grass by the root formation. Finding clumps of grass may mean tall fescue while rye grass and changeable climate grasses have a root system that can spread out. Centipede, Bermuda, St. Augustine and zoysia grasses can cause problems because of their aggressive root systems that spread quickly and can be invasive. Many annual grass types are identified by finding bunches. Feel the blade of grass to help determine the type of lawn grass. Cool season grass has ridged edges on the blades. You'll feel smooth texture on grass types such as fescue, rye grass, Bermuda; while centipede, St. Augustine and zoysia have coarse texture. Look at the color at the grass when it is healthy. Dark green colors are found in Kentucky bluegrass and fescue; Bermuda and St. Augustine grass will have a lighter lime color.